Completed 2 Million dollar renovation in 2011 to public areas, lobby, new restaurant and all new flat screens. Located in the heart of downtown within walking distance to the historic Route 66 Entertainment District featuring a variety of dinning, shopping, movie theater and night life. A 20 story high-rise hotel adjacent to the convention center. 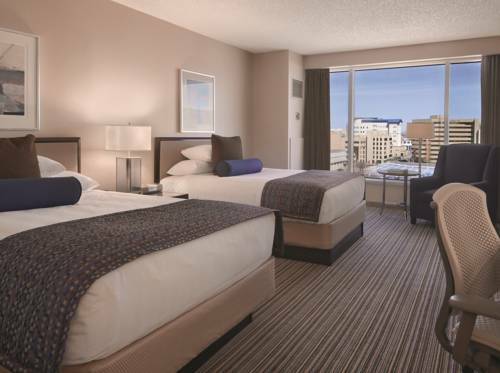 382 Deluxe guestrooms including 14 suites, Hyatt Business Plan & Gold Passport accommodations. All guestrooms have wireless high speed Internet. Fully equipped 24hr health club, Seasonal outdoor pool and hot tubs. Spa service available. Forque Kitchen and Bar full service restaurant serving breakfast, lunch and dinner. Lobby Lounge and Starbucks in hotel lobby. Just minutes from the Albuquerque International Airport, Rio Grande Zoo, Albuquerque Aquarium and Biopark, museums, championship golf courses, Casinos, dining and shopping. HQue Lounge: Lite American fare and Cocktails open Wednesday through Friday 4:00 to close. Located in the heart of downtown, across from the Albuquerque Convention Center and just 1 block from the historic Route 66 Entertainment District.